Recycling is great – but reusing is even better! 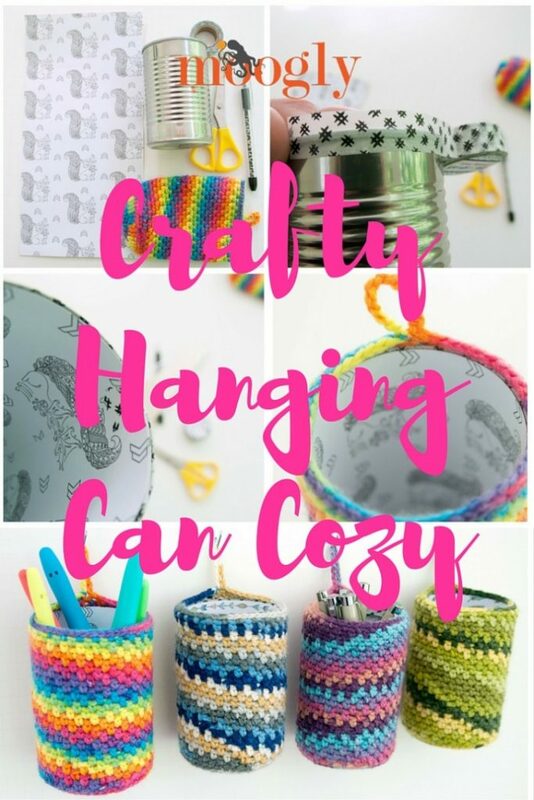 And the Crafty Hanging Can Cozy is a great way to take something that normally gets chucked in the kitchen recycling bin, and make something that’s both attractive and useful – in almost any room of the house! If you’re crafty (and if you’re here, I’m betting you are! ), you know how all those craft supplies can start to take over. Crochet hooks, knitting needles, paintbrushes, washi tapes, special pens, scissors… and on and on it goes! This summer I’m going to be remodeling part of my basement into Moogly Headquarters, and this pattern is going to be a big part of getting organized down there! 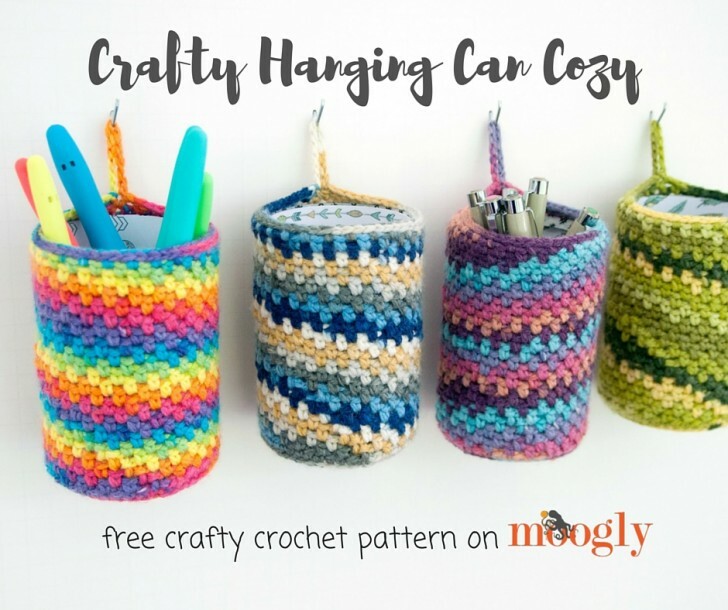 But as I mentioned before, the Crafty Hanging Can Cozy isn’t just for the craft room – you can use it in the kitchen to store utensils, use it in the bathroom to hold your makeup brushes, use it out in the garage to hold nuts and bolts… the only limit is your imagination! With the handy loop to hang it up, it doesn’t even take up any counter space! This pattern was also a fun way for me to test out Lion Brand’s new Color Waves yarn! This lovely acrylic wool blend has a hand-painted look, and in this pattern it creates these gorgeous swirls right around the can! Serendipity! Highlighted Stitches in the pattern link to their video tutorials. Round 32: Ch 12 (or to desired length for hanging loop), sl st in the same st as the join, sl st in each ch sp and st around; join and break yarn. Step 1: If there are any sharp edges in the can, use a pair of pliers to squish them down flat. 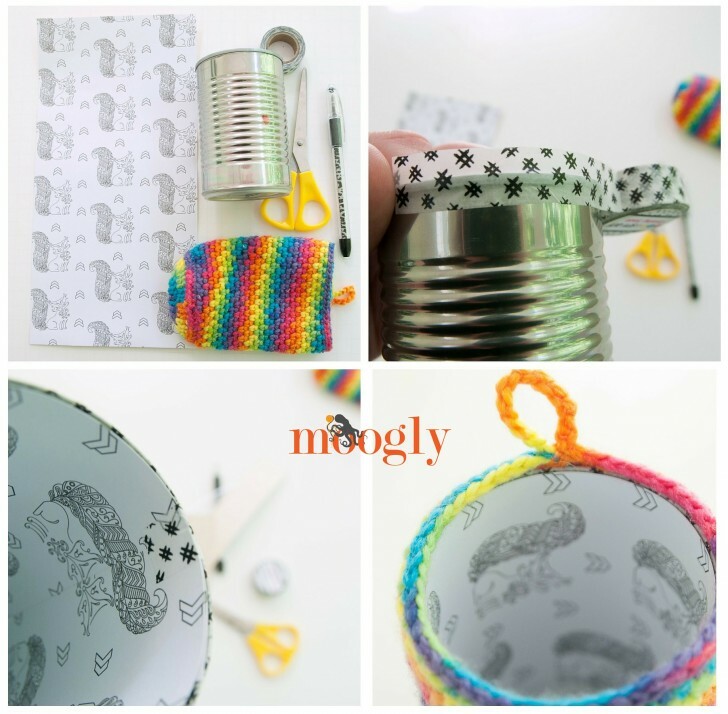 Then cover the top lip of the can with decorative tape. Step 2: Insert the paper inside the can as a lining, secure with tape if desired. 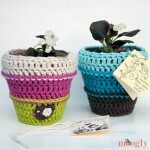 Step 3: Insert the can in the crocheted cozy. Then hang and fill! And that’s all there is to it! I had a lot of fun trying 4 different colorways – and seeing how they all reacted to the same pattern! This is a fun yarn, and a practical (and pretty!) 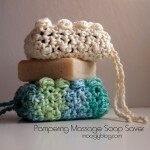 free crochet pattern that I hope you’ll enjoy! I could see these getting a lot of use in our house. I’m always short on desk space so the fact that they can hang up is a huge plus. And the colors are neat, too! Thanks! 😀 I’m so glad you like them Margaret! Yes, desk space is always a premium here too! I’m a beginner crocheter and I love video instructions! Could you put a video to this project? 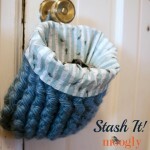 This is a great project for gift giving and personal use. What a great idea! I’m in the middle of the Big Re-Org of the whole house. Everything is getting moved out to the SeaTac and then all the furniture will be put back in a more useful arrangement. The huge yarn stash will be corraled in clear plastic bins and the fiber stash will be organized near the spinning wheels. I think the floor looms might have to be put into medium term storage – Just not enough room to have them all out in the “studio.” Anyway, I feed my dogs canned sweet potatoes and pumpkin, so I have lots of the 30 oz cans. Really good for larger size storage. 🙂 I love that new yarn you used, too. I don’t get out any more, so I don’t ever see yarn in person. I’d love a day trip to Joanns! I am always on the lookout for a nice DK wt yarn for baby stuff and this new LB yarn looks just right. 😀 I’m so glad you like it Sande! I need to do one of those re-orgs myself!! These are really beautiful Tamara! I am thinking of making one to hang in my car for stuff. I can’t stick anything to anything since it’s all plastic but this would work for pens, cords, etc. even a bit of trash! Great idea and even though the yarn is gorgeous, no one can get on the LIONBRAND website anymore as it’s really messed up. I guess we could buy it via Amazon, etc. What a fun idea, thank you Jana! Hello This is Randee I want to know if I can use construction paper in the inside of the can? OMG my sister’s name was Randee. Such a rare spelling of it! Yes my neme is a cool thanks to mom that named me. Yes! Paper, paint, whatever you like. 🙂 I just used what I had on hand! this is Randee I just got done with row 26 and it is to big for my can. So do I skip going to 31 and go to row 32 ? So the the Weight is 3 right? ok it is weight 3 thanks anyways. 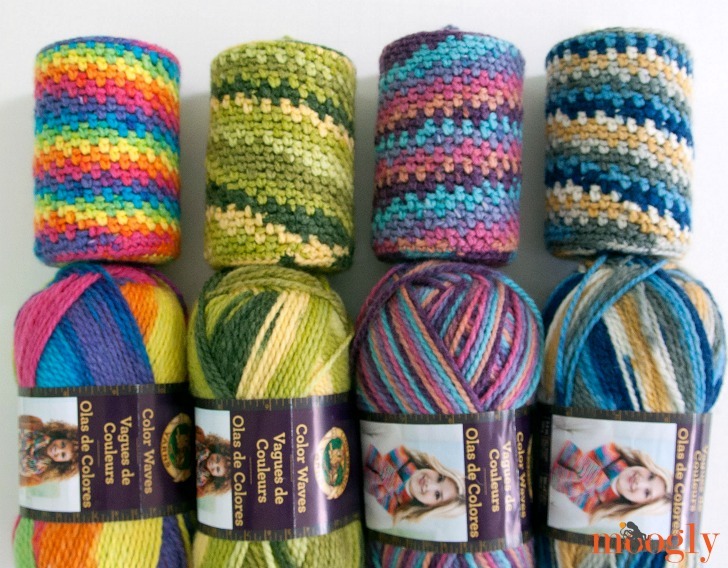 can I use worsted medium 4 yarn with this pattern? do you have anymore patterns like this one? because I realy like this pattern. I’ve ripped mine out and started over so many times and still cannot get my colors to line up like yours in the pictures ? I end up with random colors every time instead of those neat “jumping” stripes. Oh no! I’m afraid the way the colors ended up was just chance. It might help to start at different points in the color repeat. 😀 Thank you Holda, I’m so glad to hear it! Love this! 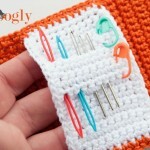 I can see how it would work in my sewing room on my pegboard! Thank you so much for sharing! 😀 I’m so glad you like it! I have mine on a pegboard now too!